WE OFFER COMBINED SHIPPING. NO HIDDEN OR ADDED FEES. ONE LOW PRICE SHIPS IT ALL! ​CLICK HERE FOR MORE INFORMATION ON OUR SHIPPING POLICIES. The American Silver Eagle is the only silver bullion coin whose weight, content, and purity is guaranteed by the United States Government. 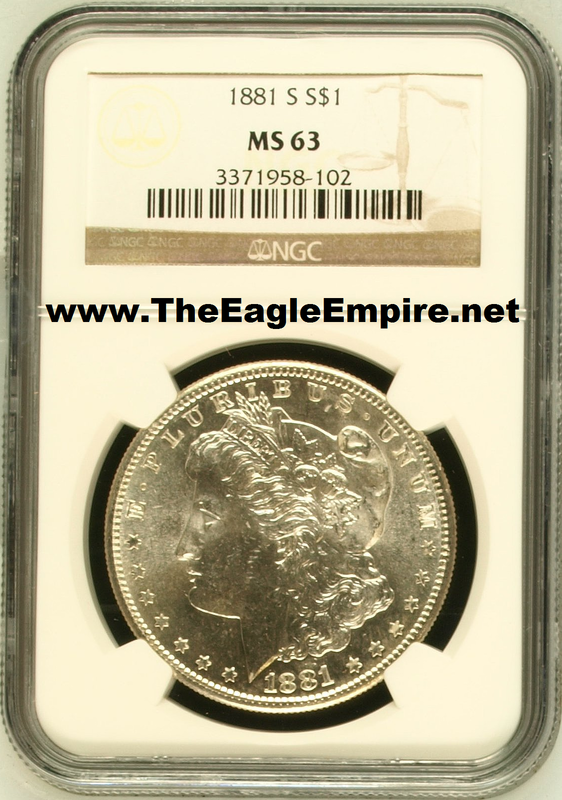 Requiring no assaying, American Silver Eagles are easily converted to cash at any time. 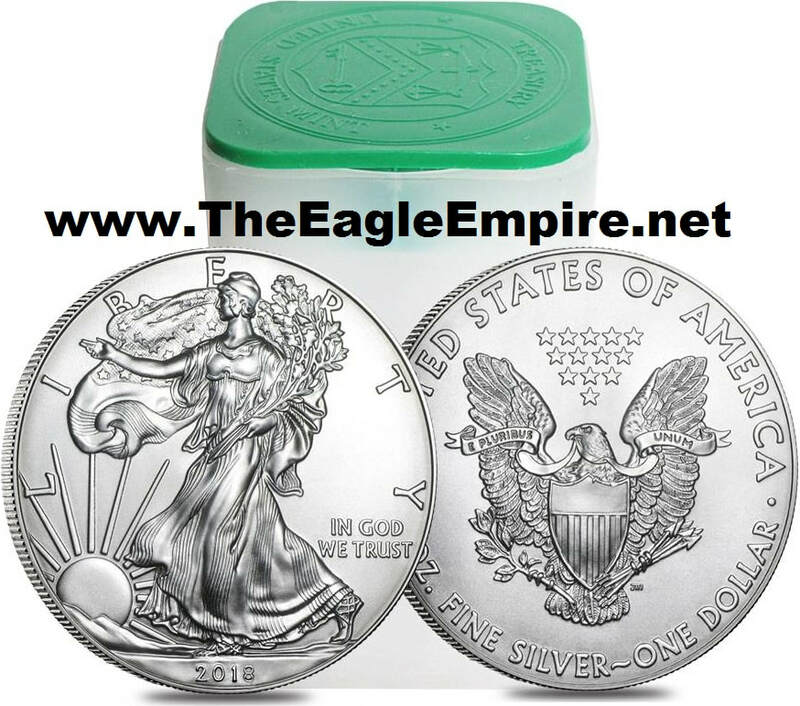 The Silver Eagle is the most popular bullion coin in the world because of its beauty, quality, and assurance of content by the U.S. Government. Each coin contains 1 troy ounce (ozt.) of silver, is 99.9% pure and legal tender. 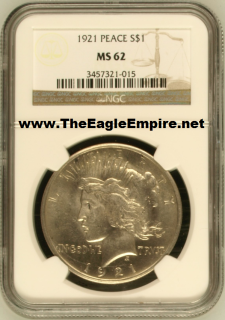 The design is based on the famous “Walking Liberty” of Adolph Weinman’s 1916 U.S. half-dollar, considered by many to be one of the most beautiful coins ever minted. American Silver Eagle Proof Coin in O.G.P. w/ C.O.A. The American Silver Eagle program was commissioned by President Ronald Reagan signing the Liberty Coin Act into Legislation in 1985. 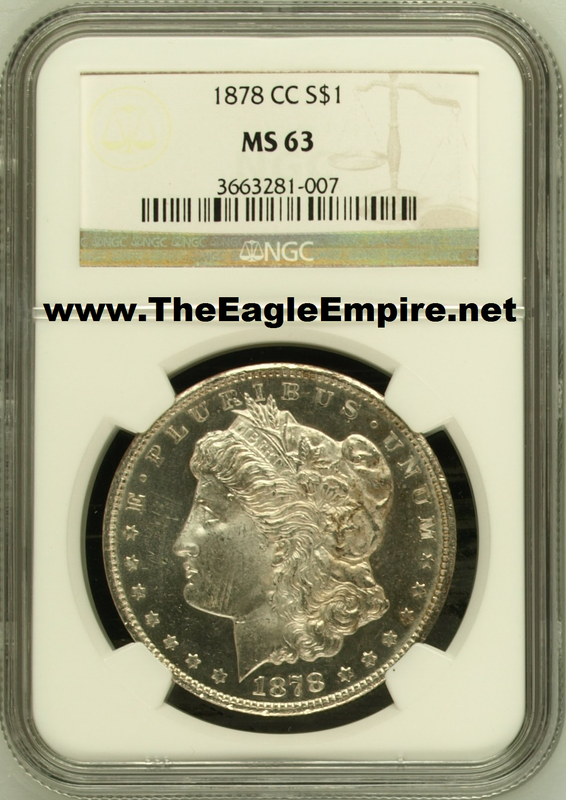 The first American Silver Eagle Coin was minted on October 29, 1986. The American Eagle Silver Proof Coin undergoes a specialized minting process, which begins by manually feeding burnished coin blanks into presses fitted with special dies. The coin is struck multiple times so the softly frosted, detailed images seem to float above a mirror-like field. 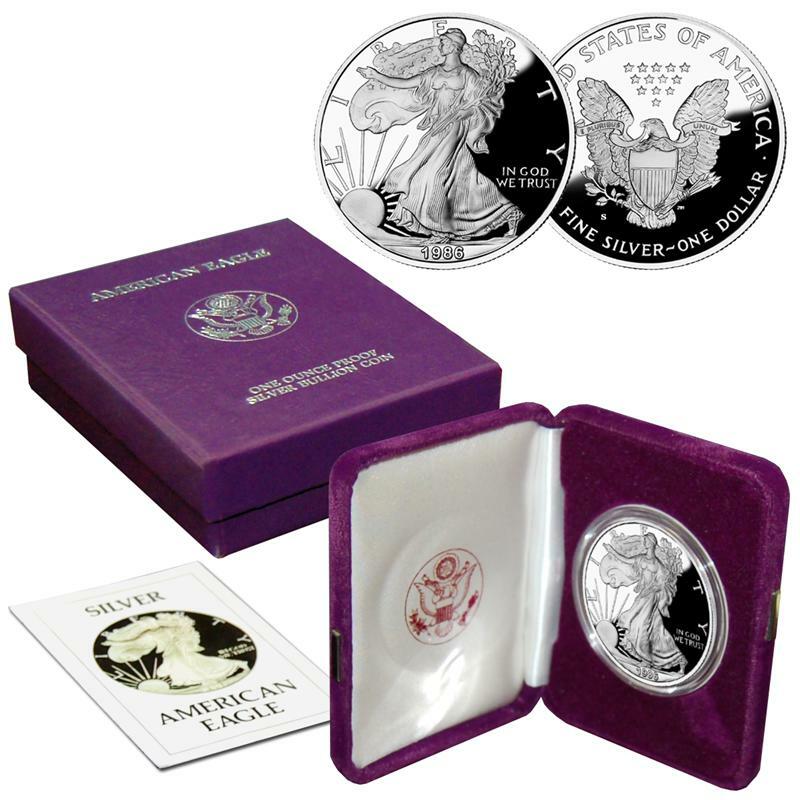 After scrutiny by white gloved inspectors, each American Eagle Silver Proof Coin is sealed in a protective capsule and mounted in a handsome satin-lined velvet presentation case with its own official Certificate of Authenticity. 2013 W American Silver Eagle West Point Mint 2 Coin Set in O.G.P. This unique 2 coin set includes two firsts. 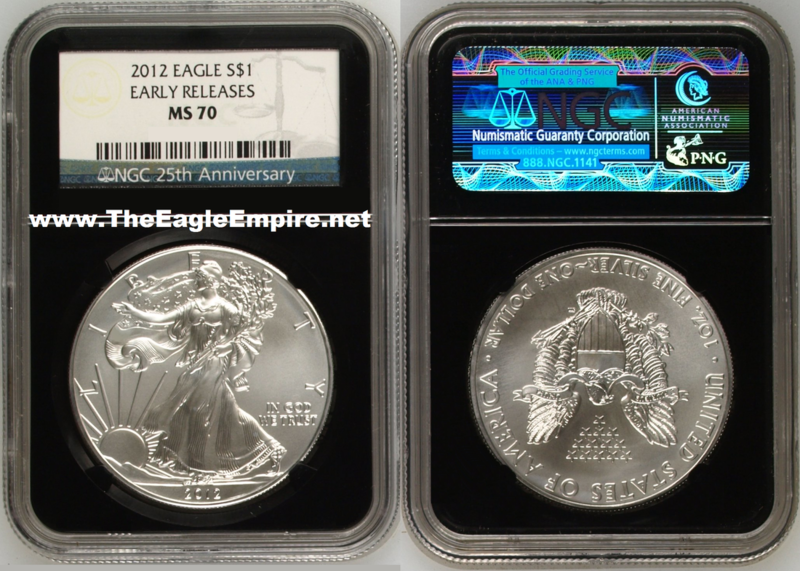 The first ever Enhanced Uncirculated Silver Eagle, and the very first Reverse Proof Silver Eagle from the West Point Mint. Final mintage was 281,310. Comes with O.G.P. and C.O.A. 2012 S American Silver Eagle San Francisco Mint 75th Anniversary 2 Coin Proof Set in O.G.P. 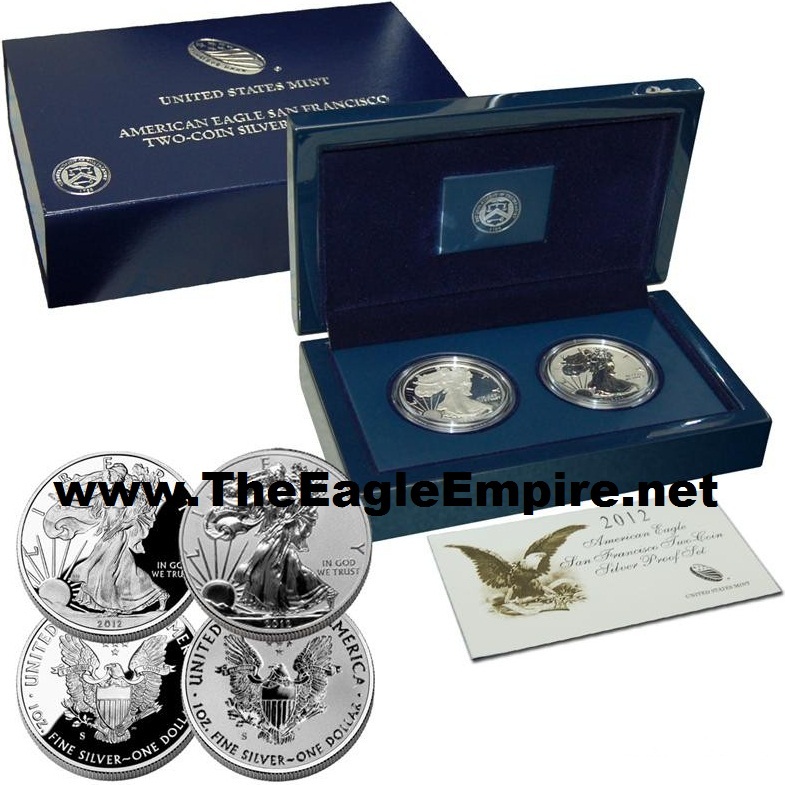 This American Silver Eagle set includes the 2012 S Proof and the 2012 S Reverse Proof. This unique pair of Proofs was only available for 28 days from the San Francisco Mint in honor of its 75th anniversary. Final mintage was 224,981 sets and the first time in history that a Reverse Proof Silver Eagle has featured the "S" mint-mark. 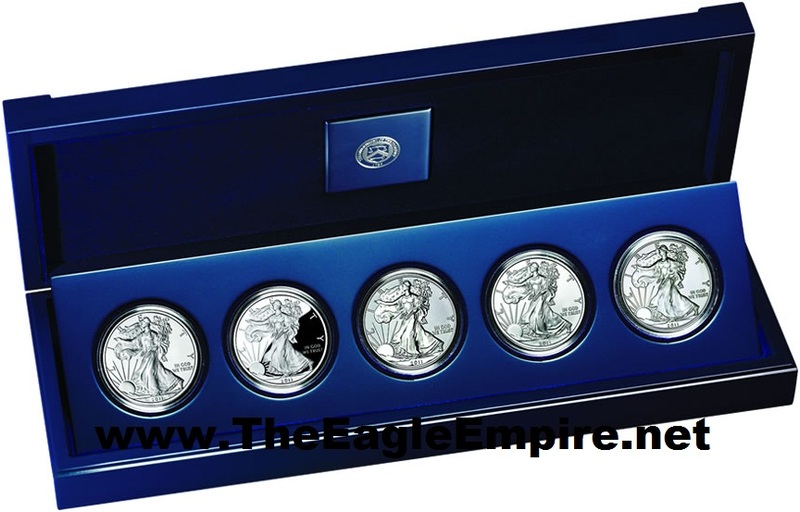 2011 American Silver Eagle Dollar 25th Anniversary 5 Coin Set in O.G.P. The United States Mint created the 25th Anniversary set to mark 25 years since the American Eagle Program debuted in 1986. 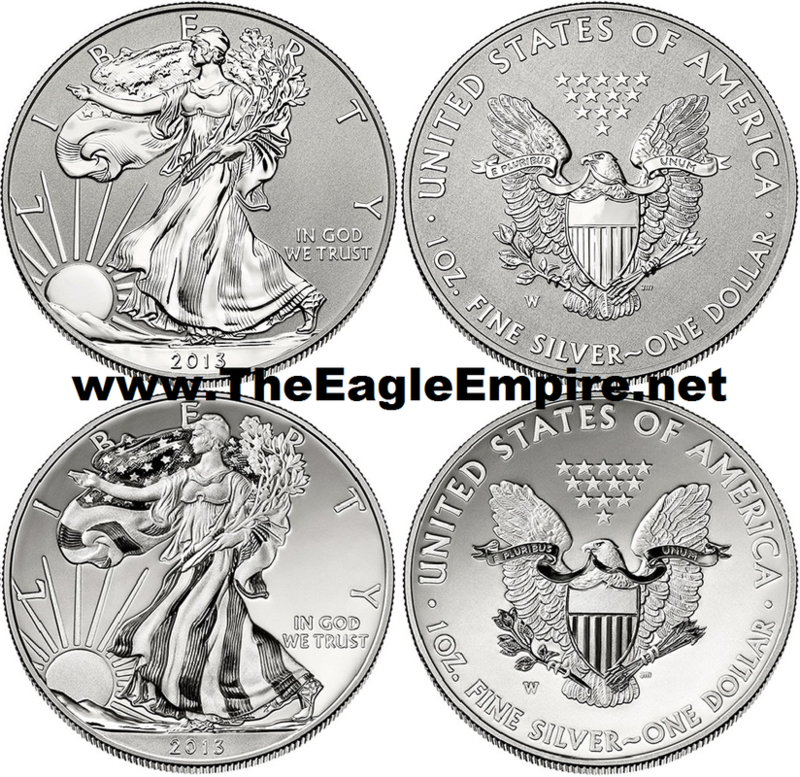 Included within it are five different Silver Eagles; a 2011 American Silver Eagle Bullion Coin, a 2011-W American Silver Eagle Proof Coin and a 2011-W American Silver Eagle Burnished Coin. Two of the coins were minted especially for the set. 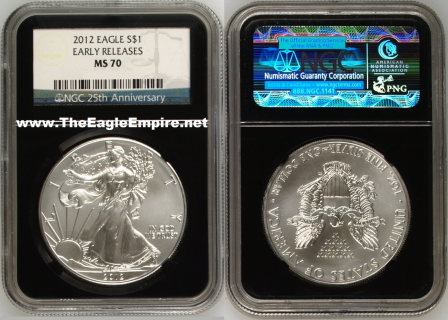 These two are key strikes in the series with the second lowest mintage of any Silver Eagle to date at 100,000. Those two coins include a 2011-S American Silver Eagle Burnished Coin, the first and only burnished coin minted in San Francisco, and a 2011-P American Silver Eagle Reverse Proof Coin. All five coins are encapsulated and packaged in a single custom-designed, highly polished, lacquered hardwood presentation case with a Certificate of Authenticity. 2006 American Silver Eagle Dollar 20th Anniversary 3 Coin Set in O.G.P. 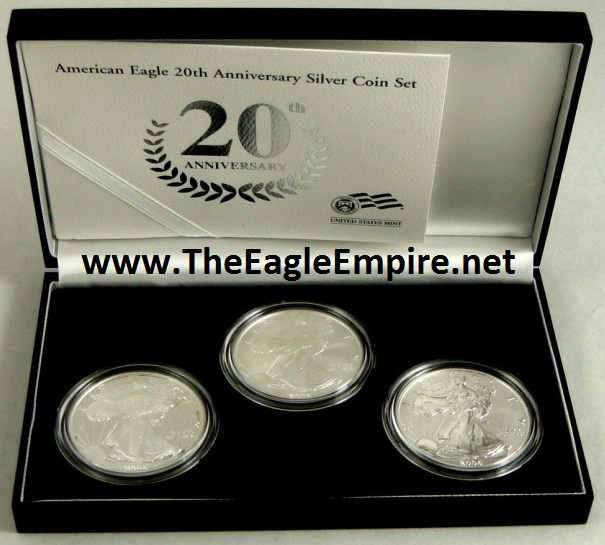 In 2006, the U.S. Mint released a special three coin set marking the 20th Anniversary of the Silver American Eagle Program. 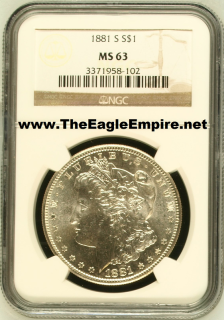 These coins were limited to a mintage of 248,875. They included the 2006 W American Silver Eagle Proof, the 2006 W Burnished American Silver Eagle which was the first of the "W" mint marks on an uncirculated collector grade coin series, and the beautiful and first ever of its kind 2006 P American Silver Eagle Reverse Proof. Complete set comes with O.G.P. and C.O.A. 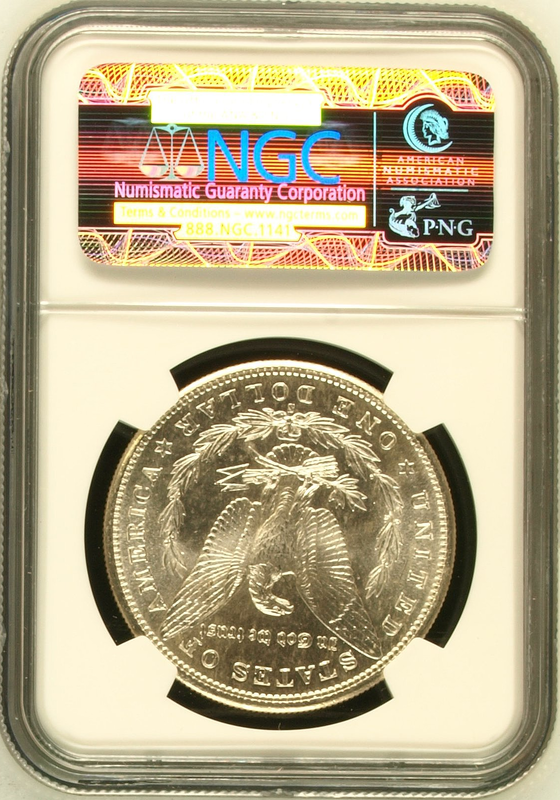 In celebration of their 25th anniversary, NGC offered a limited-edition Black Core Retro Holder and special label. Reminiscent of their original holder introduced in 1987, the Retro Holder’s sleek, black core offers stunning display of silver and gold coins. Back by popular demand, this unique holder was available on a limited basis. 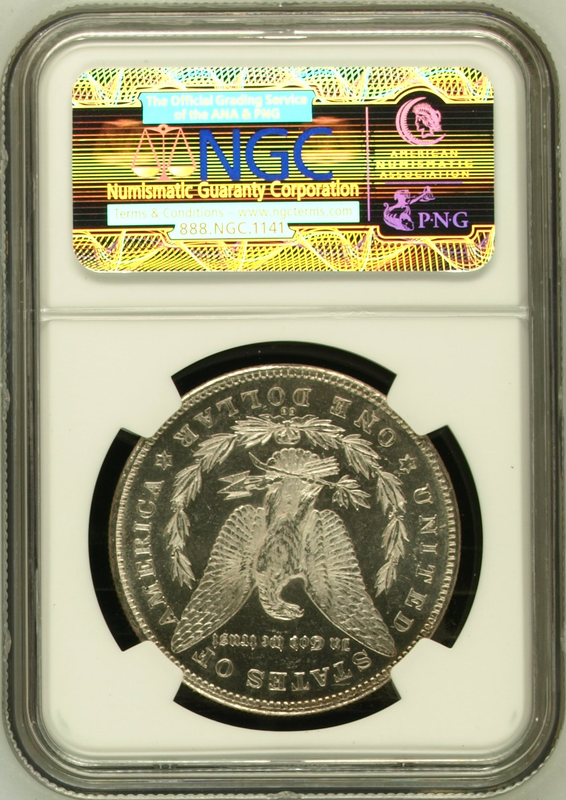 Only select types of United States coins are eligible for encapsulation in the NGC Retro Holder. 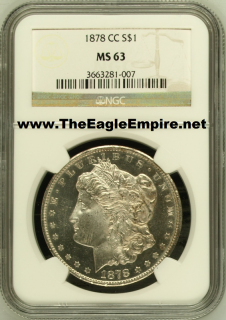 First year of issue for the Morgan Silver Dollar and opening of the Carson City Mint. "Proof Like" appearance. Key Date. Key Date. First Year of issue. The coin pictured here is the exact coin you will receive.